The weather was very hot in July in most of Europe with temperatures reularly exceeding 40 degrees Celsius. 'Hot' also describes the emotional state of the Eurozone, IMF and Greek politicians as they tried to reach a deal to prevent a 'Grexit'. It was a lesson in how not to negotiate involving brinkmanship (the practice of pushing dangerous events to the brink of disaster in order to achieve the most advantageous outcome), personal insults and accusations of lying, blackmail and threats. The negotiation ended in a complete volte-face and a deal that no one regarded as win-win and which may not survive in the medium term. The fundamental point about any deal is that it requires a degree of trust on both sides. In pharmaceutical alliances, once the trust has been broken the deal usually falls apart. Hopefully the healthcare deals announced this month have been negotiated in a more professional way because it was also a 'hot' month for MA. According to a report by Thomson Reuters, the value of MA deals in July 2015 exceeded $430bn “making it the seventh-busiest mergers and acquisition month on record” and “follows the all-time monthly high of $546.8bn” in the red-hot month of June. In July there were 14 deals over $5bn including the acquisition of Allergan's generics assets by Teva for $40.5bn and Aetna's acquisition ofHumana for $37bn to create a US healthcare insurance company with 33 million customers. Why is the MA market so hot? The reasons include market confidence (especially since the Greek crisis was 'resolved'), low interest rates and a strong dollar, activist investor encouragement and 'strategic' factors such as companies seeking to re-structure their portfolios and to increase market share and earnings by cost synergies. The market optimism has also spread to the UK where the biotech industry has suffered for many years from a lack of funding. According to the report by Evaluate and the BIA, there were only five biotech IPOs in the six-year period from 2008 to 2013. In 2014 alone there were nine, raising over $600m (£408m). The opening of the IPO exit route has also increased venture capital funding. This month, Immunocore which develops T-cell receptor based drugs and has a lead product in Phase IIa, raised $320m (£205m) via a private financing round from a syndicate of investors, including Woodford Investment Management (a UK investment fund) and Eli Lilly. Woodford has also been an investor in the deal whereby Novartis spun off three phase II products for an equity stake in a newly formed company, Mereo Biopharma, which raised $119m. It is hoped that Immunocore and Mereo are signs that at long last the UK is attracting risk capital for biotech companies. The summer is expected to get hotter! In early 2014 Actavis sold most of its European generics business to Aurobindo and in March 2015 completed the acquisition of Allergan. In June Actavis changed its name to Allergan so at this time there was a strong suspicion that Actavis would at some time exit from generics. This has been confirmed with the acquisition by Teva of Allergan's generics business for $40.5bn. This is an expensive acquisition with a sales multiple of over 6 and an EBITDA multiple of 15 before synergies. The high price may reflect Teva's desperation as it faces generic competition to Copaxone (the first generic was approved in April) and noting that Teva's hostile bid for Mylan was unlikely to succeed because Mylan had set up a Dutch trust with the power to veto an unsolicited bid. However, Teva's deal with Allergan is not over yet. It is subject to review by antitrust regulators of the combined generics portfolio. The consolidation in the generics industry has also increased with Lupin's acquisition of the US generics company Gavis for $880m at a high sales multiple of nine but which has 66 ANDA filings and a pipeline of over 65 products. In July Lupin also acquired a factory in Russia and a speciality product portfolio from Temmler in Germany. Lupin is a $2bn company and growing by the day! There is concern amongst the regulators and US insurers that consolidation of generics companies will lead to higher prices so it would not be a surprise if the regulators ask Teva to divest some products as a condition for approval of the Allergan deal. When Teva bought Allergan's generics, Mylan probably thought it was off the hook in respect of the hostile bid from Teva. Mylan cheekily congratulated Teva on the deal and reiterated its ambition to acquire Perrigo. Investors were not impressed as Mylan's share price fell by 14%. In the meanwhile Perrigo continues to build its brands with the acquisition this month of Naturwohl in Germany for an undisclosed amount. The transaction with Teva has not stopped Allergan continuing with deals. In July it announced three deals costing nearly $1bn to bolster its product pipeline. One was the acquisition of Naurex for $560m plus undisclosed milestones. Naurex has two NMDA anti-depressants in late stage clinical development. The second deal was the acquisition from Merck Co, for $250m plus milestones and royalties, of an oral calcitonin gene-related peptide (CGRP) receptor antagonist programme with the lead product at the end of phase II for treatment of migraine. The third deal by Allergan to bolster its pipeline was the acquisition of Occuleve, a medical device company with a product in late stage development for treating dry eyes. The deal was a similar structure to the Merck Co deal with an upfront ($125m) and commercial milestones. Teva is not the only company paying a high price for acquisitions. Celgene's acquisition of Receptos for $7.2bn is, according to Reuters, rumoured to have been too high a price for AstraZeneca (AZ), Gilead and Teva. Although Celgene's offer represents a share price premium of only 18%, the share price has quadrupled in the last 12 months from around $46 to $195 prior to the bid from Celgene at $232 per share. Celgene believes Receptos's ozanimod in phase III for ulcerative colitis could reach peak sales of $4bn to $6bn per year. It still sounds like a high price but perhaps it is in Celgene'sDNA because only a month ago it bought shares in Juno Therapeutics at over a 100% premium in return for a $1bn deal for a 10-year collaboration. With these high acquisition prices, a number of big pharma CEOs, eg Roche, GSK, have commented that many of the assets they look at are not acquired because the price is too high. Andrew Witty some weeks ago commented that the low cost of capital is causing companies to pay prices based on 'stretched valuations'. The Federal Reserve Board Chair, Janet Yellen, mirrored these comments in her report to Congress in mid-July commenting “Valuation metrics in some [areas] do appear substantially stretched - particularly those for smaller firms in the social media and biotechnology industries, despite a notable downturn in equity prices for such firms early in the year”. During July Sanofi entered into a new collaboration with Regeneron to develop novel antibody cancer treatments based on programmed cell death protein 1 (PD-1) inhibitors. Sanofi has committed $2.17bn including an upfront payment of $640m and a milestone of $325m. Biogen also broke the $1bn headline in a licence and collaboration deal with AGTC for gene based therapies to treat ophthalmic diseases. As one would expect with high risk gene based therapies, the deal value is heavily back-end loaded with just over 10% of the total headline value as an upfront($124m including a $30m equity payment at a share price premium of 20%). 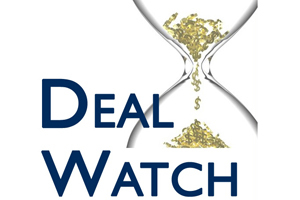 Another back-end loaded deal, that is a company acquisition but has deal terms like a licensing deal, is the acquisition by Merck Co of the Israeli company cCAM Biotherapeutics for $605m with 16% ($95m) upfront. cCAM is developing an immune checkpoint protein belonging to the Human CEA (Carcino-Embryonic Antigen) protein family. At the most extreme in terms of a low upfront is the $7m paid by Tigenix in the $293m acquisition of Coretherapix, presumably because stem cell therapies are high risk. The Middle East is a growth area for pharmaceutical products but in some countries the Governments impose import controls or require local manufacture. Valeant has dealt with this issue by buying an Egyptian company with product sales and a local manufacturing plant for $800m plus contingent payments. Valeant is following in the steps of other big pharma companies such as Sanofi, AbbVie, Pfizer and Merck & Co who have manufacturing in the Middle East. AZ continues to make deals in all parts of the world as part of its strategy to rationalise and improve its product portfolio. As part of its product divestment programme AZ made two deals this month. Firstly the divestment for up to $300m to Genzyme of Caprelsa (vandetanib), an orphan drug treatment for thyroid carcinoma. There is an upfront of $165m (sales multiple of 3.4) and $135m in milestones. Secondly, AZ sold Entocort (budesonide) global rights except the US to Tillotts, for $215m representing a sales multiple of 4. This product is a perfect strategic fit with the Tillotts GI franchise and is expected to be a transformational deal. In Japan, AZ paid $45m for an option with Kyowa Hakko Kirin to commercialise benralizumab (currently in phase III for treatment of severe uncontrolled asthma and COPD) in Japan. AZ originally licensed the rights to the molecule from BioWa, a subsidiary of Kyowa Hakko Kirin, in all countries except Japan and certain countries in Asia. Still in Japan, a week later AZ agreed a joint venture with Fujifilm Kyowa Kirin Biologics for the development and commercialisation of a biosimilar version of bevacizumab (Avastin) in phase I in Europe for treatment of various cancers. Fujifilm Kyowa KirinBiologics will transfer the product rights to the new joint venture in return for $45m, which happens to be the same amount as the option payment from AZ to Kyowa Hakko Kirin. A strange coincidence!